← Why Are There So Many Wizard of Oz Sequels, Prequels, Remakes and Spinoffs? 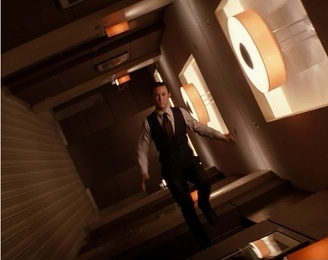 Since I first saw Inception in theaters, it has been needling in my mind. Not because it’s a bad film, but because it is so creative and unique that I wanted so badly to come up with an equally creative way to talk about it, as it deserves. Ironically, the angle I finally found is one that emphasizes the aspects of this film that aren’t as original as I previously thought. This in no way takes away from Inception’s greatness, but it simply elevates another film in my eyes by how it managed to explore many of Inception’s themes and use impressive special effects 46 years before Inception was conceived. The film I am talking about is Mary Poppins. I had never seen this old Disney film all the way through until recently, and I probably enjoyed it as much as an adult as my children did. I’m not going to make the case that these two films have the same plot or tone, but that they have a lot of similar themes, characters, and ideas. So get ready for a spoonful of mind-blowing adventure as we explore the similarities between Inception and Mary Poppins. A husband and wife have completely different views about the way things should be. They have a son and daughter who are neglected. Characters break the laws of physics in their dreams. One dream ends in a sudden deluge of water. A significant part of the plot involves improving a father-son relationship and changing a businessman’s mindset. A father, who is the leader of a giant corporation, dies. The main character uses subtle means to plant ideas in others’ minds. The main character is begged not to leave by someone who loves them. Someone close to the main character encourages them to return to reality soon. A husband and wife are unable to see eye to eye on big issues that affect the way they live. 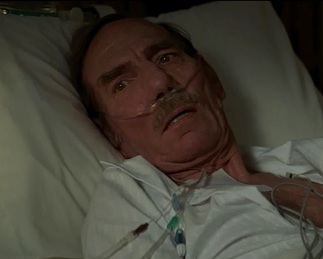 In Inception, Dominic Cobb can’t convince his wife Mal of what is real and what isn’t. She believes that she’s living in a dream world and everything around her is fake, except for her husband. Her efforts to convince him of what she believes are just as fruitless as his. Eventually, their disagreement comes to a head when she kills herself to escape what she perceives to be a false reality, leaving her husband to mourn her loss. Mary Poppins does something interesting by having a husband and wife who believe in incompatible sides of gender empowerment. The husband George Banks believes in the idea of a man being the lord of his home while his wife Winifred is semi-secretly engaged in the fight for women’s suffrage so that men and women will be equal in society. George openly spouts his ideas to his family while Winifred hides the fact that she is a “sister suffragette” because she worries it would infuriate her husband. Eventually, this dichotomy will come to a moment of crisis, but since it’s a Disney movie we are spared the ensuing arguments and potential disenfranchisement. The husband and wife have a son and daughter who are neglected for various reasons. Cobb loves his son and daughter more than anything, and it breaks his heart that his wife thinks they are not real and, thus, not worth her time. The night she kills herself, she makes it look like Cobb is responsible for her death, so he’ll have to flee the country and probably never be able to see his children again. The children lose hope that they will ever have their father with them again. George thinks he is always too busy for his children, which is why he hires nanny after nanny to watch over them. His wife, too, though a little more involved in her children’s lives, is so busy pursuing her suffrage cause that she spends little time with them. As a result, the children cause all sorts of mischief and drive away all of their nannies in an effort to get their father’s attention. While the reasons for the parents’ aloofness from their children are different, both films present a similar problem: children are upset at not spending any time with their parents. Inception focuses on the father’s attempts to reunite with his children while Mary Poppins focuses on the children’s attempts to get closer to their father. A character designs dreamscapes and visits them with other characters. Cobb hires an architect to design the mazelike layouts of several layers of dreams he plans to take a team into. She winds up joining the group, as well. 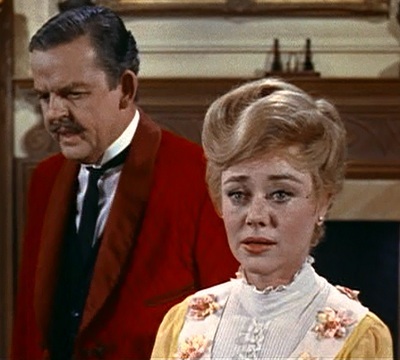 Once Mary Poppins enters the picture, she introduces the children to a lot of magical situations, most involving a poor, kindly fellow named Bert. When they first meet Bert, he is drawing several murals on the ground, one of which they decide to pay a visit to. This is fairly straightforward, so I don’t think it requires any explanation for how the films are similar in this respect. Things that shouldn’t be able to happen frequently do in these films. I’ll use two examples from each film to typify what I mean. In Inception, the architect’s first visit to another person’s dream world leads her to start using her creativity to literally flip the world upside down, build bridges from mirror images, and perform all sorts of other normally impossible tasks. Later, a character is in a hallway where gravity keeps shifting so he is jumping from the ceiling to floor and doing other amazing stunts without batting an eyelash at how insane the situation is. 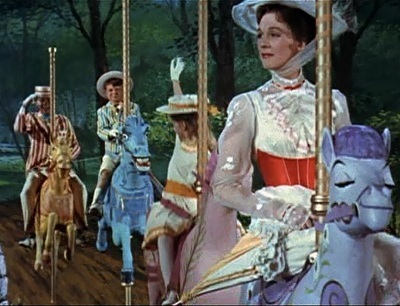 In Mary Poppins, at one point the titular character is on an aptly named merry-go-round when she suddenly decides she’s tired of just going in an endless circle, and she releases her horse from the track so she can go exploring. 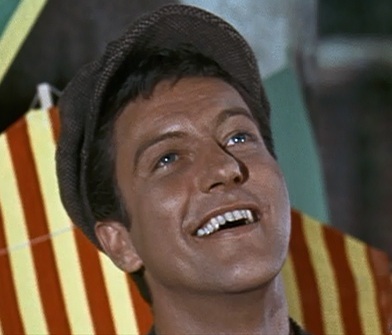 Later, Mary Poppins treats flying as a nuisance rather than an incredible feat when she comes across her uncle who floats when he laughs and inspires others to do the same. Each film has a good mixture of newcomers and people who are experienced at the dream world so that the audience isn’t totally alienated or bewildered by strange events. People suddenly awake from a dream after being flooded with water. Cobb is so deep in sleep at one point that it takes a dunk in a bathtub full of water to rouse him. The effect in his dream is quite memorable. Mary Poppins and the children are enjoying themselves in one of Bert’s paintings for a long time until they find themselves in a blinding rainstorm. And before you can say supercalifragilisticexpialidocious, they’re out of the painting and back in reality. A simple but effective way to get the characters out of their dreams. Through each film’s course, children are reconciled to their father and a businessman decides to change his course dramatically. The main plot of Inception involves getting a business owner’s son to break up his company after his father dies. To do this, they trick him into thinking his father wanted to make amends in his dying moments by telling his son not to follow in his footsteps but to do something more with his life. 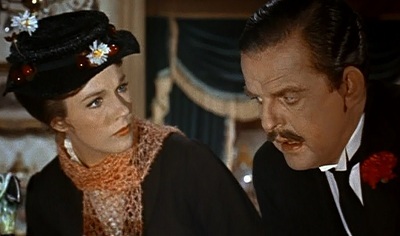 Mary Poppins magically comes to the Banks family to convince George to change his priorities and spend more time with his children. In the end, her advice and example help him realize what he’s been missing and he decides to put work second to his family. To prove his change of heart, he fixes his children’s kite, which had been a source of annoyance to him at the start, and then flies it with them. He even gets an unexpected promotion within his company after his priorities change. I admit that there are many differences between the films on this point. Inception’s reconciliation is a lie, and the result is a broken-up company. Mary Poppins has a true restoration of the father’s love for his children, and his company doesn’t get broken up, though it does have a potentially ruinous run on the bank at one point. The leader of a large corporation dies off screen, which has a big impact on his son and other characters. When the leader of a multinational conglomerate dies in Inception, Cobb and his team have to race to get to his son in time to convince him to dissolve the company he is about to inherit. When the leader of a bank that George works at suddenly dies of laughter, it is a cause for celebration as much as sorrow because he had never been happier, and his death allows others to rise into new positions of leadership. The deaths of the two fathers provide a stark contrast. 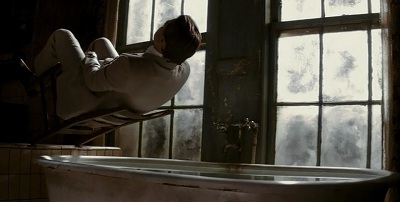 Inception portrays the father as a coldhearted creep who doesn’t love his son, and seems to cling to life out of spite. 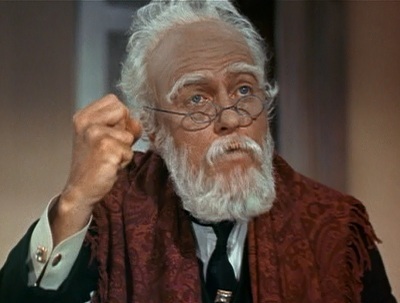 Mary Poppins, on the other hand, shows a greedy, senile old man who has a change of heart at the last minute, which ironically leads to his death. The main character makes another character believe they thought of an idea when it was actually planted in them. Cobb and his team successfully suggest to the business owner’s son to destroy his company by going deep into his subconscious and manipulating him into giving himself the idea. Mary Poppins is less cerebral but no less effective. During each of her conversations with George, she gets him to do what she wants, including hire her and spend time with his children, by turning things around on him and making it seem like he is the one suggesting those ideas. He is left confused and eventually he figures out that she bamboozled him, but the results wind up being positive, so he’s not too upset with her. One character pleads with the main character not to leave in the end. Mal lives on in Cobb’s dreams (or nightmares) because he refuses to let her go. He can’t stay with her, though, no matter how much she begs him to. Eventually, he chooses to leave her for good. Mary Poppins faces a similar choice. She can only stay with the children long enough to change their father and then she has to leave, presumably to help other children in need. No matter how much the children ask her to stay with them, her answer is always a flat no. Even though Cobb is clearly still in love with Mal, and Mary Poppins loves the children, they can’t stay with them because that would be selfish on their part. Cobb needs to be with his children in the real world, and Mary Poppins needs to let the children’s father take over the role she is temporarily filling. The main character is warned or invited to return to the real world soon. It’s a warning in Inception because Cobb will be stuck in limbo forever and lose his mind if he doesn’t perform one last task quickly and then get out. The architect is the one who warns him. It’s an invitation in Mary Poppins because as Mary Poppins leaves on her umbrella Bert spots her and encourages her to brighten all of their lives again when she gets a chance. This could possibly go down as my most controversial Movie Matchup ever because on the surface these two films could not be more dissimilar. I don’t think anyone else would come out of a viewing of the lighthearted Mary Poppins thinking of how much of it relates to the psychological thriller Inception. But that’s the point of the Deja Reviewer website. I want to look past the obvious and look at deeper connections between seemingly disparate films like these. I think it’s fascinating to see how Inception and Mary Poppins are so alike and yet different because it gives a greater appreciation for the films while adding another dimension to them. I hope you’ve had your mind expanded by this discussion. Now if you’ll excuse me, I feel like taking a nap. All images are the copyright of their respective owners. Read more Movie Matchups here. This entry was posted in Movie Matchups and tagged action movies, christopher nolan, disney, family, films, inception, mary poppins, movie review, movies, relationships. Bookmark the permalink. 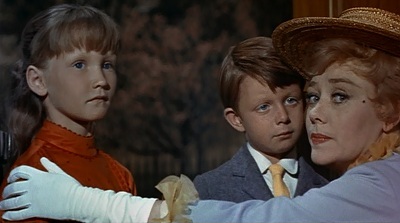 I wonder what Mary Poppins would be like if Christopher Nolan did a remake that film today? Maybe the dance scenes would be a little more dramatic and the horse rides would have been a little wilder? That would be interesting. Thanks Rob. Good eye for the hidden meanings in life (and film). Not having watched ‘Inception’ yet, I am now more than curious about it. But, I think I’ll keep your comparisons from my wife prior to our seeing it. I’ll share it with her afterward, I promise. I’d have guessed that marrying those two movies would be a bit of stretch, but you backed up your premise solidly. That’s one in the ‘win’ column, any day. I totally ruined the plot of Inception for you. Oops.There are a lot more twists and turns than I mentioned, though, so hopefully it will still be an amazing viewing experience for you and your wife. As I sit here tonight, I have a copy of “Inception” in the DVD player, ready to go. Have no fear: your write-up will not affect my enjoyment of it one iota. Wouldn’t have even thought to rent it otherwise, honestly. Christopher Nolan is one of my favorite filmmakers, especially since I heard that he supports the Tea Party. Yeah, I liked the guy from the start. Plus, after watching “Dark Knight”, you got the feeling whose side he was on. Appreciate the heads-up on this, Robert. Quick question: just Tweeted this out, but you should do more on Twitter. This stuff would fly out there, I believe. Thank you for that suggestion. I definitely need to use Twitter better. I will try to improve in that area. It’s hard to keep up with all the ways we can put our material out there. Your blog is a natural fit. People would rather read something like this (it’s fun and often funny), rather than political stuff like mine which often causes their blood pressure to spike….even with a liberal dose of humor. I’ll start including you in my #FollowFriday tweets. Be warned!